Use the Drop Down Menus Below to Check Out All Our Products! The Rod of Asclepius is the internationally recognized symbol of the medical profession. 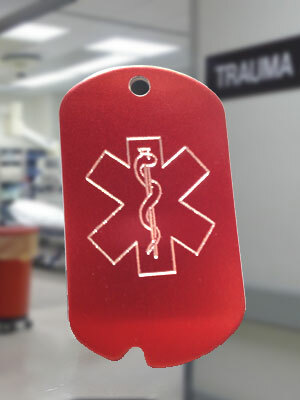 Medical Identification Dog Tags with the universal medic alert logo engraved on the front of the tag. Alert Medics to your medical needs, even if you are unconscious or too young to explain your existing conditions and you can also provide a brief medical history. Lightweight red anodized aluminum dog tags are comfortable to wear and are suitable for men, women, and children to wear at all times. Engraved dog tag with the MEDIC ALERT INSIGNIA on the front and 5 lines of your emergency information engraved on the back. (1) Red anodized aluminum medical ID dog tag with engraved medic alert logo. FREE engraving on tag back (up to 5 lines of 18 characters). (1) 24" stainless steel beaded necklace chain to wear your medic alert dog tag. (1) rubber medical dog tag silencer in your choice of colors. 18 Characters per line and spaces count as a character. & ' . - , # * : / " ( ) @ + $ % ! ? Your choice of any text on the front of your medical alert dog tag and any silencer color. Get $1.50 off each tag .... if you order two or more of this item! Medic alert for diabetes, asthma, hemophilia, and epilepsy. A medic alert for interactions with food or drugs and to show drugs you use like Coumadin. Alert medics to heart disease, heart valves and pacemakers. A medical id dog tag to show special needs, autism, and Alzheimer’s disease. Any medic alert condition that may need attention from Emergency Medical Technicians(EMTs). “We just received our dog tags and we can't be happier. My 13 year old son is a type 1 diabetic and is presently going thru a tough time with the disease. We received the tags and it truly helped him getting back to school and catching up with his missed work. All of his classmates were interested in the dog tags and he was flattered with the attention he got. I can tell after the first two days he was returning to his old self. He proudly wears his tags and I really feel it's helped him emotionally deal with diabetes in a positive way. Thanks much!!"